When complete, this site will provide a listing of all UK stage appearances by visiting American (or Canadian) rock’n'roll acts. This is a massive undertaking and at present is very much a work in progress. 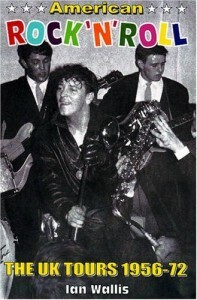 The first 30 artists, including Gene Vincent, Little Richard, Chuck Berry, Jerry Lee Lewis and Carl Perkins are in place and I intend to gradually expand it to bring in all the American rock’n'rollers who played live in Britain since 1956. I am listing each tour with both the dates and venues, along with the names of the backing bands. I hope that this information will prove to be a useful source of reference to both writers and scholars alike and also of interest to fans of the music who can look back on shows that they enjoyed long ago, as well as ones that they missed and have regretted that fact ever since. This is only the bare bones of the story and my two books,’ American Rock’n'Roll – The UK Tours 1956-72 ‘ and ‘More American Rock’n'Roll – The UK Tours 1973- 84′, published by Music Mentor Books, provide the full story of each tour including contemporary show reviews, the names of the tour organisers, a summary of British television appearances and even the identities of the supporting acts..
Did you know for example that Elton John opened for Little Richard at London’s Saville Theatre in December 1966, or that when Fats Domino played a week at the same venue the following March his opening act was the Bee Gees? The books also contain lavish illustrations, including rare show programmes, tickets, advertising flyers and countless previously unseen photos. 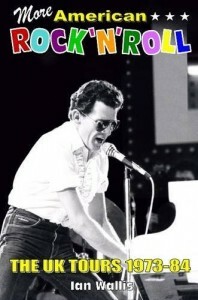 I hope that this site will make you sufficiently curious that you will purchase the books and learn the complete story of live rock’n'roll in the UK. You will not be disappointed. As well as putting this site together, I am also hard at work on volume 3, to be published later this century ! I look forward to receiving your feedback and in particular any omissions or corrections to the tour details. I am satisfied that I have managed a high level of accuracy, but as shows were often cancelled or switched at short notice and the music press in the early years was notoriously unreliable, it is probably unrealistic to expect to reach 100% accuracy. If you have any information, I will be pleased to hear from you. I have now included details of all the UK tours made by Ronnie Hawkins & the Hawks. Ron is now semi-retired in Canada and at the age of 83, it is extremely doubtful that he will come back again. which is understandable, but a great pity. As probably the only person who attended every one of his 10 UK shows, I can promise you that he was a superb stage entertainer and a truly great character. Long may he enjoy his well earned retirement after a lifetime in the bars and nightclubs. I am now turning my attention to the late Sonny Burgess and over the next couple of months will input details of his many UK shows, starting with his exciting appearance at the Weymouth weekender back in 1984. Please let me know which artists you would like to see included after Sonny.